I know that I’m a couple weeks late but….Happy New Year! Have you created your 2018 goals yet? I hope that you have, and that you are joyfully and consciously moving towards them. Depending on the depth of your sincerity, I’m sure that the Universe will provide many great ups and downs to help you achieve them 🙂 . Remember that everything is your choice. You can take every single one of your hardships and turn it into a precious blessing. Or, you can just suffer repeatedly with a victimized mentality. Always check yourself to see what you are choosing. So, I enter 2018 walking on a tight rope, balancing the ability to see the insanity of my habits and illusions even more clearly than ever, with a much expanded ability to return to my center, to remember who I am, to challenge myself physically, emotionally and spiritually for my continued growth. It’s a unique place to be internally – one I have not experienced yet – and I feel grateful. You must understand the relationship between yourself and your emotions: emotions are not you, but yours. Emotions are merely a variable environment that affects you like any other surrounding that you experience. You can choose to walk away from an emotion the same way that you choose to walk out of a room. You can change your emotions because they are only your internal environment, not the essence of who you are. No matter how much you try to control your mind through meditation and training, however, negative emotions will arise within you. You’ll be lonely, sad or angry at times. That is normal. As long as we live entangled in countless people and events, such emotions will arise. Because we live in many external and internal environments, emotions are bound to arise according to changes in those environments – just as our days are not always sunny but sometimes cloudy, windy or rainy. Holding your center allows you to calmly watch such changes. It’s important not to get bogged down by negative emotions. It’s natural for emotions to arise but you must guard against getting stuck in those feelings and being led around by them. Flailing about in a quicksand of negative emotions for a long time saps your strength and makes you feel lonely, afraid and unhappy. Such emotions bring your energy down, making it darker and heavier. This passage brings much clarity and even as I write it here I can feel parts of it penetrating my brain and giving me a sense of hope and eagerness for my own growth and the path ahead. It’s a great passage to read many time sover, absorbing the key points deeper and deeper, and resetting your brain with this healthy understanding. First thing happy 2018 to you too, you aren’t late. We are only two weeks into the new year, and people kindly keep reminding me that this year I am turning 25. I feel like I am turning 52. I live in a little town in Italy, where people like to gossip, and they like seeing other people suffering. However, here I am, on the 16th of January already feeling not so happy about 2018. I was really positive about this year, until the 2nd of January. I am studying to become a Pharmacist. I already attended all classes, but I still have 14 exams to pass, in Italy it works like that, nobody helps you at University, you have to help yourself, if you can’t cope, it’s your problem, the professors, well, for most of them you are just a number, the ID number, or you are just a surname on a list of people waiting to sit at an exam. I hate it about Italian university system, they don’t care about students, not at all. However, my resolutions for 2018 are finishing my exams at Uni without becoming insane and losing weight (I am already on a very strict diet, but I am very pleased, I lost 20 lbs and I can see my waistline again 😉 ). Now I feel already stressed by University. I have the first exam in 13 days and I feel like I can’t do it, that I’ll never graduate, that I’ll disappoint all people I care about and mostly I’ll disappoint myself, but not my present self, but the 16 years old me, the one who was so ambitious who applied for an exchange programme in the USA (They didn’t choose me, unfortunately) who started to think seriously about University and the one who won a literary contest in the area. Now I am everything I didn’t want to become when I was 16, a 24 years old, single (at that time I was in a relationship with a boy, I thought he was the love of my life and I thought we were going to get married … we broke up two years ago and I think I am still recovering from it), fat (I am still fat even if I lost those 20 lbs), behind with her studies (shame on me, shame on my laziness) and not so happy. At the end in my life I want to be HAPPY (I wrote it down here, finally), I want to feel happy with myself, accomplished, proud of myself (I think I’ll sound quite selfish). I want to be happy and I want to be an adult, finally, not a student anymore. I found myself being envious of my friends, who are surely smarter and will be better people in life outside University, who have already finished who are finishing their Uni courses. I am happy for them, really, but I feel also envious. I feel a bit envious of people in nice and happy couples. I cry every time I see a wedding picture on television or on magazines. Pachelbel Canon can make me cry for half an hour. I broke up very badly with my boyfriend and after two years it really hurts, I am a bit of a slow recovery person, I think because people after two years many time have already a new boyfriend and they are planning big stuff with him … I am still crying about what ifs. I think I’ll change my resolutions from specific goals to try and be happy and try and move on, stop crying about my ex, stop feeling stupid because I am taking more time than other people to get my degree. Thank you for your sharing, Arianna. I think that your priest friend gave you very good advice 🙂 . And I think that your comment about your new walking routine is very hopeful! I encourage you to keep increasing those kind of activities in your life – things that make you feel “well”. Try to find more things that make you feel that way, continuously directing your eyes there, on the days that are hard for you. I’m sending you lots of life particles for your journey!! The Women’s March today brought a true sense of solidarity and channeling of positive emotions to enact change. When we unite, we have the power to heal and begin the long journey to fight against oppression and injustice. Your philosophy and unique yoga practice is both inspiring and comforting! Happy New year friend! I miss you, and we need a tea date! I have a friend who I am sending your way; via this blog LOL. She is on a journey, and it’s right in line with yours… all of ours I guess 🙂 She will gain so much from your beautiful writing and the outpouring of your heart! You don’t know how much you help people, and what a blessing you are! Sending love, light and virtual hugs! Thank you Jen!!! It’s so nice to hear from you ~ I miss you too! 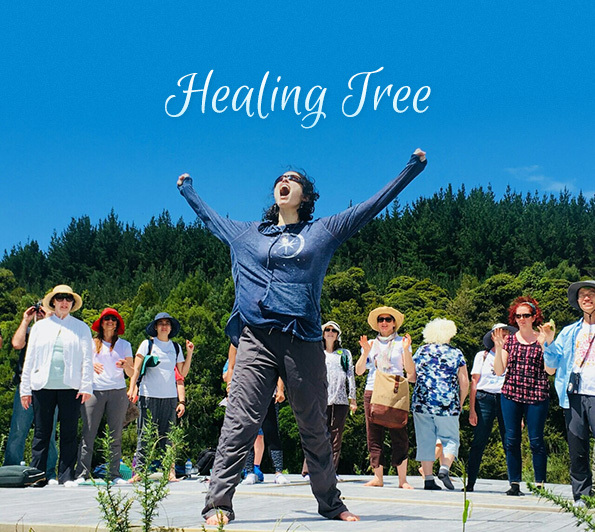 Thank you for sharing Healing Tree 🙂 I’m sending light and love and virtual hugs back to! As always i find the time to settle into your blog while my mind is clear and i am at sea. Going back and starting at the beginning of the year seemed like a very good place to start. Which for me brought a new theme word to have in my heart while reading. Last year was the year of “Love” which was almost a direct result of what I learned from “Finding True Self Workshop”. I literally loved my word for 2017 and found it difficult to refocus my heart on something new this year. I choose “Compass” for awareness,purpose, and direction as i felt like a lot in my life may be changing this year… and so much already has. As for your passage from 120 years, i like it and had to re-read it several times. I find the subject of emotions very hard for me and i felt conflicted and accepting, practically at the same time while rereading this passage. I have found in my past i would not allow my heart to experiences my emotions, i would just block my heart from many emotions including sorrow, anger, loneliness, but even happiness and joy i found i was not experiencing their wholeness and depth. Ilch Lee talks about having the strength to escape from those negative emotions, but i feel like for me i had the strength to escape it, i just had not found the strength to acknowledge those emotions, let them in, and experiences them. I feel like i experiences the opposite struggle that he describes in parts of this passage. Once i acknowledged this and made the effort to be more conscious of not only recognizing these emotions, happiness and otherwise, but truly allowing my heart to acknowledge and truly experience them i found it grew my soul and deepened it in ways i never knew i could. That truly experiencing these emotions of loneliness, sadness, etc it did not bring my energy down but made it deeper. I hope i am making sense on some level here….. I find this subject of emotions to be so interesting and full of depth. I feel like i start to begin to understand then have to peal back another layer… anyway i will stop my babbling! Thank you for sharing this passage with us. It makes me so happy to think of you reading my blog while you are out at sea, Steph 🙂 . And what an interesting word you have chosen for 2018! That definitely makes me think of direction. I’m sure you’ll have a new sense of ‘direction’ within this year. As for your comment regarding emotion, let me explain… Yes, you are right, first we have to face our emotions honestly, before we can get mastership over them. Mastership would be, as he says, the ability to “escape” them, rather than be controlled by them. In your case, you needed to first come out of what I would call “avoiding and numbing” your emotions so that you could feel yourself more deeply. Congratulations on doing that! If you think about it, you were avoiding and numbing yourself from them because they were too painful for you, therefore they were controlling you. Now you have taken the appropriate step to feel them, so you feel more connected and free. It means those feelings are actually controlling you less. It’s great news! So enjoy feeling them. But remember, those emotions are not your true self, they are just layers over your true self. But by feeling them, it means you are actually getting closer to your true self, rather than avoiding them, which is also avoiding your true self. You understand, right? I am happy that you are doing such good work on yourself! Blessings to you across the ocean!!!!! !